It’s a well-known fact that the overuse of salt in the food that you consume can put you at a higher risk of having high blood pressure and heart related diseases. However, most people discard the possibility of salt causing obesity as salt doesn’t have a whole lot of calories. Some research suggests otherwise. So, does salt make you fat? Let’s find out. As already stated, the main reason why nobody really gives any thought to the idea that salt can cause obesity is that salt hardly contains any calories and it’s the calorie intake that defines how much weight a person would gain or lose. There is no denying both these facts. However, it’s also true that calorie count isn’t just the only benchmark which decides whether a person would gain weight or not. There are a number of other factors involved as well. Let’s see how much of a role salt plays in these factors to answer the question ‘does salt make you fat’. While salt has no calories of its own, research has shown that it increases hunger. And when you get hungry more often, you will eat more food items and thus, take more calories and this can lead to weight gain. Research also says that dopamine is released when salt is consumed which increases craving for salty foods like French fries etc. which are both high in calories and rich in fat. Intake of salt is accompanied with an increase in thirst and while this may not really pose a problem if you would start to drink water to quench the thirst. However, according to research, salt’s consumption increases craving for sugary beverages and high calorie soft drinks which can certainly lead to weight gain. It’s not just calories that increase weight but also the way your body treats fat. Research has shown that the body starts to produce a greater amount of insulin when the food items being consumed are rich in salt. Insulin is a hormone which keeps fat stored in the body. So, in simple terms, salt heavy diets would increase insulin levels which would in turn increase amount of fat in your body which would in turn increase your weight. To sum it all up and to give a proper answer to the question of does salt make you fat or does salt make you gain weight, it can be said that salt on its own is a healthy substance. Our body requires salt as it acts as an electrolyte. The problem is with over consumption of salt heavy food items. It’s not just the extra salt in these food items which can lead to weight gain, salt heavy food items are often full of fat and calories too which can lead to weight gain. So, consumption of such food items like burgers, French fries and frozen pizzas is what needs to be avoided and not salt itself. So, if you are wondering about does sodium make you gain weight then you should understand that it’s only excessive intake of sodium/salt that can make you gain weight. According to Dietary Guidelines for Americans, an individual should not take more than 2,300 mgs of sodium in a day. For individuals who are over 51 years of age or who suffer from diabetes or high blood pressure or kidney disease, the limit lies at 1,500 mg per day. In order to have an idea about how much sodium is a part of your diet, you should know that 1 tsp. 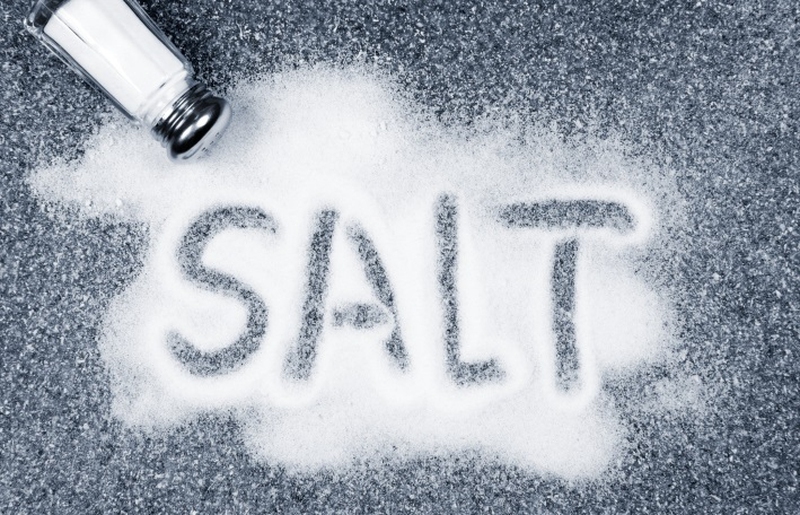 of table salt (which consists of sodium and chloride) contains 2,300 mgs of sodium. Along with table salt, prepared and processed foods also have sodium. You should keep all this in mind when deciding on your diet plan so that you don’t exceed the sodium limit. Here we explain more on amount of sodium in different salt quantities and how to limit salt consumption. Bloating that is caused by an increase in consumption of salt would eventually decrease once you will move to a sodium regulated diet. However, the process would obviously be slow. In order to quicken it up, you should drink a lot of water and incorporate food items that are rich in potassium, fiber and vitamin B-6 in your diet. It’s important that you keep your salt and sodium intake in check at all times so that you don’t become a victim of obesity as a result of high salt intake. Server responsed at: 04/19/2019 8:37 a.m.